Equine founder is another term for equine laminitis, which means inflammation of the laminae. The laminea is tissue portion of the horse’s foot that sits between the bones of the toe and the hoof wall. This tissue is full of blood vessels that feed the hoof. Inflammation of this tissue spells trouble. With equine laminitis the blood circulation is cut off to the toe portion of the hoof. If treated quickly it can be helped. If this goes on for long it causes death of the tissue and bone rotation. The bone can separate from the hoof and allow bacteria to enter. This is referred to as ‘seedy toe’. 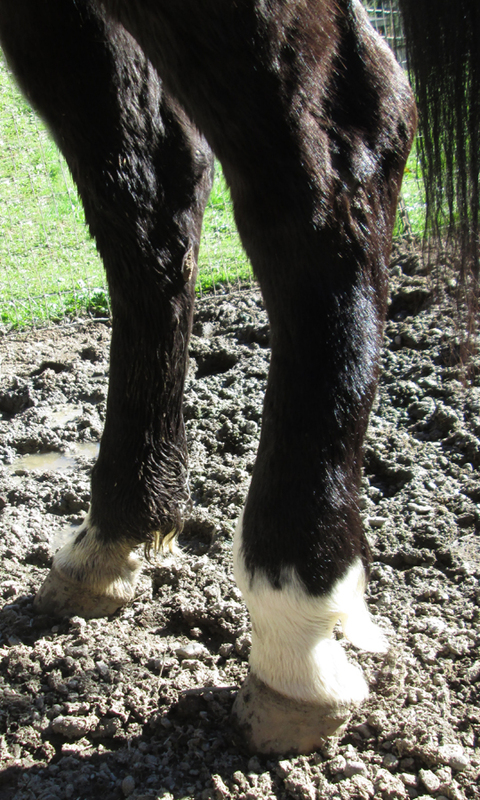 The disruption in the blood flow of the hoof causes permanent horizontal rings to grow on the hoof wall. If that’s not bad enough, the bone of the toe actually begins to rotate so that it penetrates the sole of the hoof. At this point the horse must be put down. The problem with equine founder is that once it had occurred, the horse is more prone to laminitis again and again easily becoming chronic if not closely monitored. Equine laminitis is very painful and usually affects the only front feet, but it can affect back feet too. The horse will show reluctance to walk or stand, and show signs of pain when walking. When standing, the horse will attempt to take weight off their front feet. They will do this by placing their back feet farther forward under their belly and extending their front feet forward in an attempt to carry their weight more on their heels instead of the painful toe. A horse that has suffered from chronic founder will have horizontal rings on the hoof wall. Laminitis in horses can be caused by a number of things, the most common being grain overload, followed closely by the ingestion of too much green grass and sudden feed changes. Other causes are the horse being ridden too hard, especially in an over weight or out of condition horse. Horse founder can also be caused by repeated hard concussion….running a horse on cement or excessive work on a race track. Giving a hot sweaty horse cold water before cooling the horse down can cause laminitis. Equine founder can be associated with uterine infections after foaling, pneumonia and toxemia related to drug overdoses. The good news about equine founder is that it can easily be prevented in the first place, and can have good outcome with proper care. You can avoid grain overload by introducing your horse to grain slowly and never feeding more that 1.5% of their body weight in grain. Grain overload is an emergency. Grain overload can quickly cause the bone in the hoses foot to rotate. If you suspect your horse has eaten too much grain, get them to a vet immediately. If the grain is allowed to be digested, it’s too late; the damage to the foot has already been done. Introduce your horse slowly to green grasses. Start out grazing your horse on green grass 10-15 minutes per day for a few days, and then increase that amount by 15 minute increments every few days until the animal can graze for 2 hours without consequence. It is especially important to keep an eye on horses that are solely pasture fed. If you notice your horse getting grass fat, developing a crest neck, and generally out of condition…pull them off that pasture. Those conditions are the ideal setup for laminitis in horses. 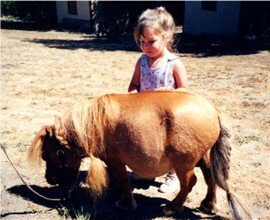 Ponies are particularly susceptible to equine founder. 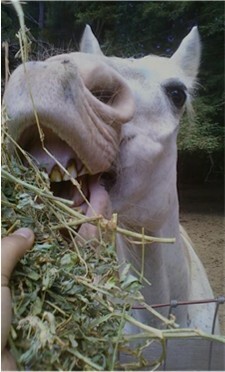 Some horses can get so bad that they are never able to eat green grass or pasture again, ever! Horses that have suffered a grain overload and are taken to a veterinarian are given large quantities of mineral oil via a stomach tube. This is to prevent the digestion of the grain to prevent founder and colic. Antihistamines are often given with care not to cause toxicity. Over weight horses and ponies that have suffered equine founder are put on a weight loss diet. If the founder is from grass, the animal is not allowed access to green grass pasture. Talk to your vet about the best feed choices for horses and ponies that have foundered. Corrective shoeing by a skilled farrier can help on many levels. Adjusting the angle of the hoof offers the horse some pain relief and promotes proper blood circulation to the laminae tissue. This is critical for tissue restoration and encourages the bones of the foot to realign properly. The farrier may use a combination of leather pads and specialized horse shoes. Sometimes acrylic compounds are used to build up portions of the hoof and to protect the sole of the foot. Severe equine founder can be a death sentence for a horse. But founder that is treated quickly and managed properly can result in a horse capable of a living a long, healthy and useful life. 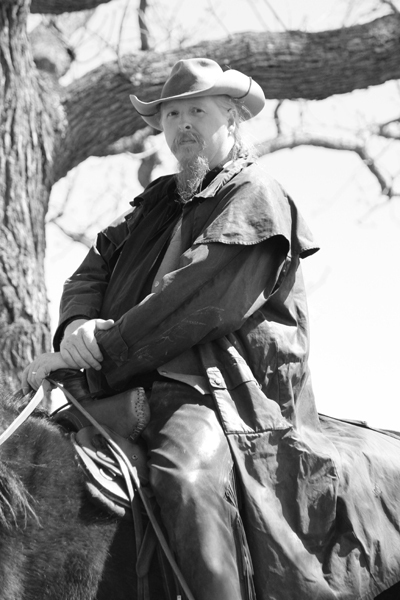 Informative interview about horse shoeing with farrier Jarl Viale. Learn to avoid laminitis by feeding safe amounts of ﻿horse grain concentrates. How much to feed your horse? From salt blocks to grain choices it's all here.